Scanned image of view of SE corner from embankment. 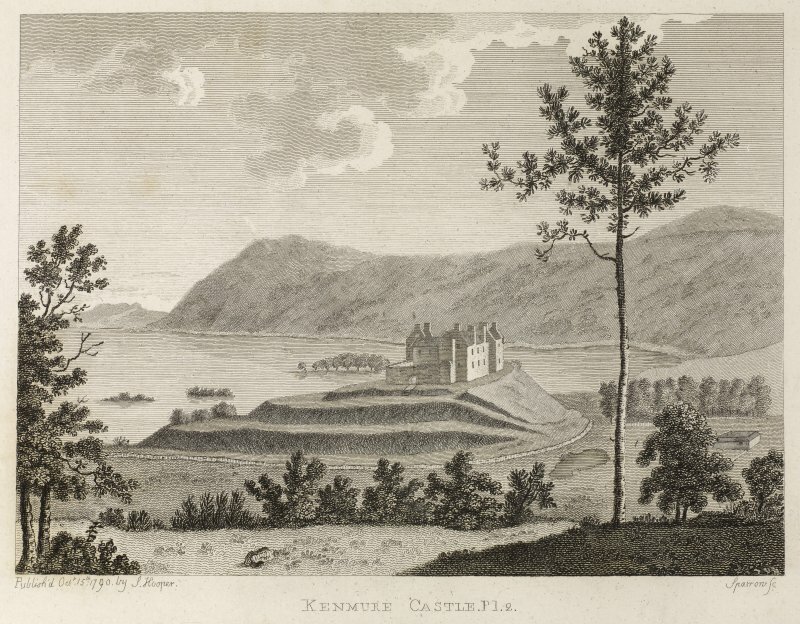 Scanned image of engraving showing view from NE. 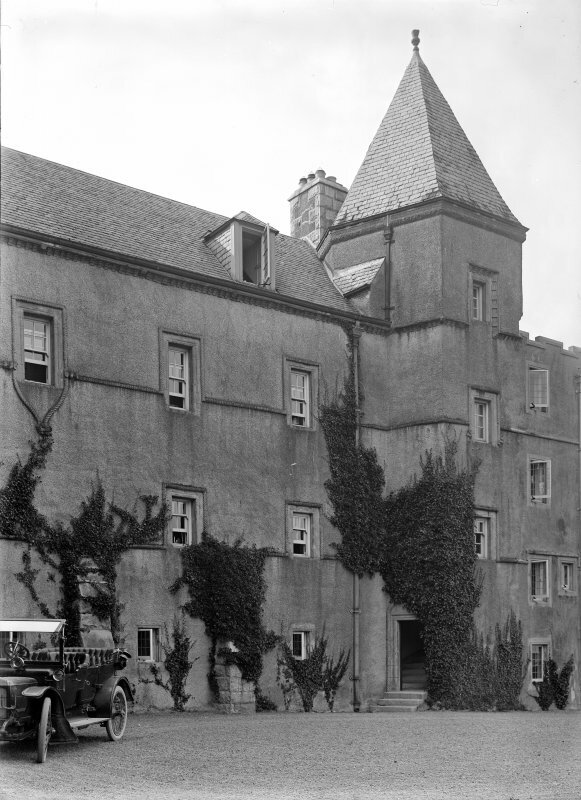 View of E wing, Kenmure Castle. Detail of carved panel over window. 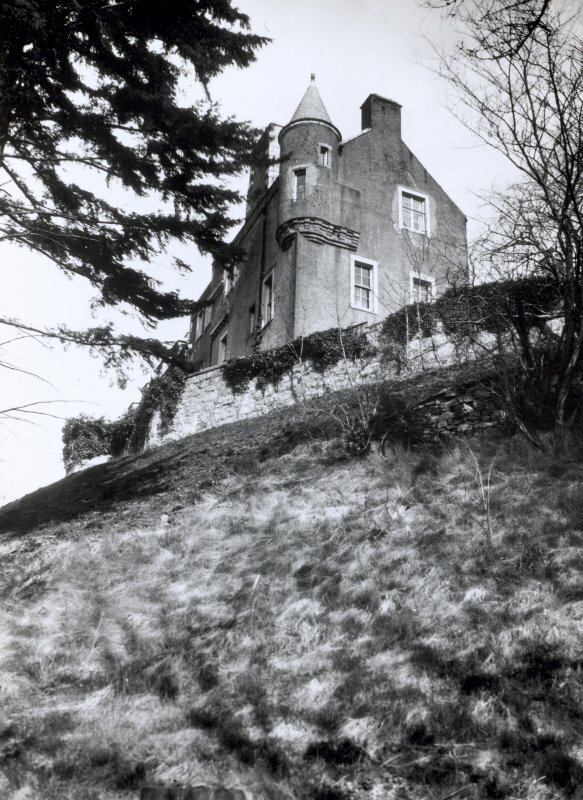 (NX 6353 7640) Kenmure Castle (NR). 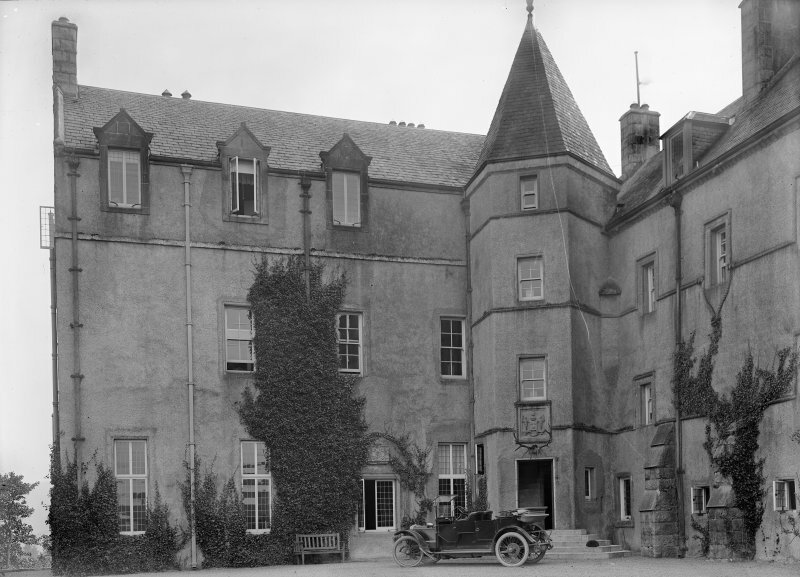 Still a fine mansion in 1935, Kenmure Castle has been a roofless shell since at least 1960. The castle was originally of the 'courtyard' plan consisting of west and south ranges, three storeys and an attic in height, with a high enclosing wall on the north and east and an arched gateway in the north wall. There were towers at the NW and NE angles. The latter with the harled west and south ranges remain to gable height. 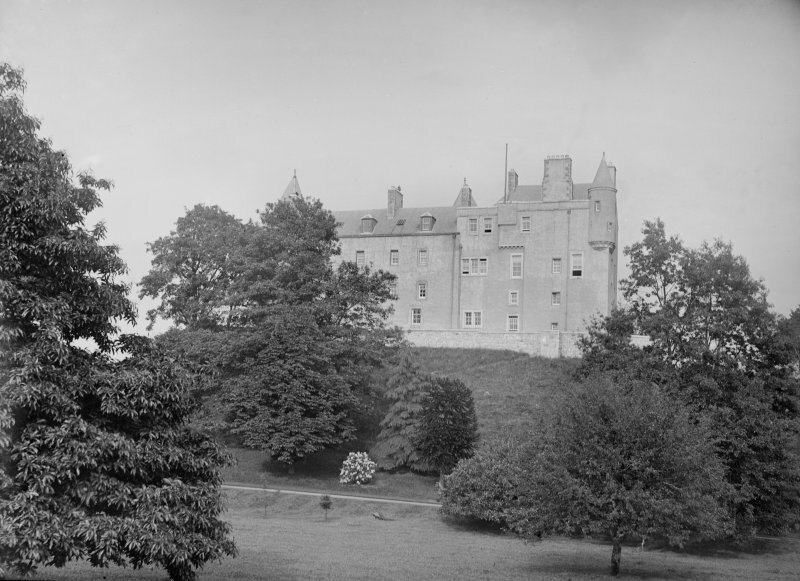 Though the castle was in ruins by 1790 (F Grose 1790), it was completely remodelled in the 19th century much of its archaic character being destroyed. The NE tower and the courtyard walls were demolished as were most of the outer defences which Grose's view shows to have consisted of a wide moat with three internal ramparts on the north. Traces of the moat are still visible on the west. The castle occupies the flat summit of an artificial-looking knoll on which, however, rock is exposed on the south. 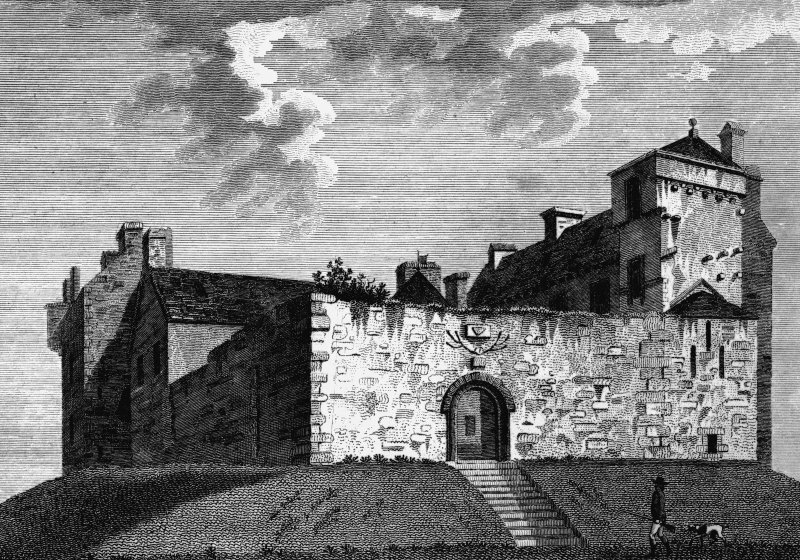 The site is said to have been occupied by a fortress of the Lords of Galloway and John Balliol is said to have been born here in 1249. 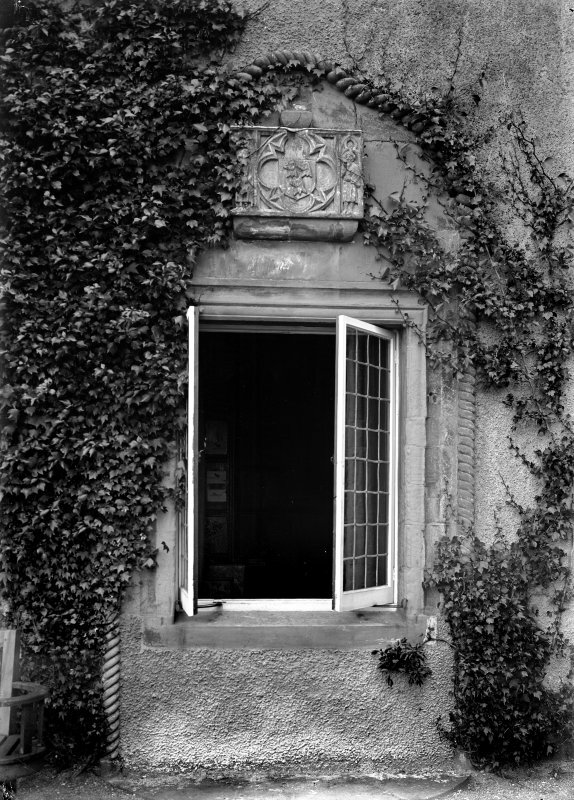 The property belonged to the Gordons from 1297 and a heraldic panel bearing their arms surmounts the south door. While it is possible that a portion of the present building may be 16th century,the greater part is 17th century. Part of an incised cross-slab lay beside the door in 1911; and a font was preserved in the garden in 1887. A large slate sundial made in 1623, which originally stood in the gardens was donated to Dumfries Museum c1967. The roofless ruin of Kenmure Castle (name verified by J Chalmers of New Galloway) is completely gutted and in a state of decay. The external detail has been obscured by harling but internally much of the pre-19th century stonework, including four vaulted cellars, can be identified. There have been additions to both the NW corner and the south face since the plan of 1892 but there is no evidence of any other earlier structures. The knoll has been extensively landscaped, the large part of which was presumably carried-out during the 19th century remodelling. The only evidence of Grose's "wide moat" is a rectangular basin, 65.0m N to S by 55.0m, on the west. This however seems more likely to be a landscape feature than a defensive moat. The remainder of the hill is surrounded by marshy flood-plain that was almost certainly under water at one time. A large slate sundial from Kenmure Castle and bearing the date 1623 is in Dumfries Museum. Visited by OS (BS) 27 May 1977. NMRS REFERENCE Medium size. Seventeenth Century (extended). Traditional style (Scottish). Derelict. 1 engraving: Earnock Manuscripts, II, 7.